When I heard of Pope Francis creating a new Marian feast, I had already been commissioned by Fr Phil Lloyd of St Theresa’s Church (thus the roses that Master woodworker Roberto Lavadie lovingly “set into” the frame) in Houston, Texas. 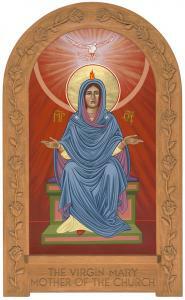 Fr Phil invited me to create a Marian icon, as well as other icons for the church. I was ecstatic that I would have an opportunity to visualize this new icon and hopefully give life to it through the intercession of the Holy Spirit and Our Blessed Mother. I found an old black and white drawing done in 1909, in an old missal; and this became the starting point for my inspiration. I could write an entire blog about how those incredibly beautiful and intricate black and white Catholic Missal drawings, with a veritable encyclopedia of mystical symbols, influenced my entire childhood. And these illustrations have stayed with me into adulthood, as Ever-Bountiful fountains of living waters. In creating this feast Pope Francis wants the Church to reach for a “Marian character,” or to become increasingly Mother-like. What does this mean for us? Let’s look at a couple of theologians who I think begin to articulate the on-going mystery of this new feast. They may seem a bit dense or abstract but they are filled with real life inspiration and instruction, I hope and believe. “The world is now in the time of choice...The choice facing us has become clearer-to say yes or no to the Risen Christ. In this phase of salvation history, Mary is transferred for the remaining earth-time to what the imagery of the Book of Revelation calls ‘wilderness’ or ‘desert.’ The ‘desert is the place of impoverishment and distress on the one hand, but also a place of rejuvenation, of concentrated attention to God. In the desert Mary remains what she was and will be for all eternity: the mother. This mother gives Christ to the Church and the world ‘not just at one single moment in history but at every moment of the history of the Church and the world.’ In doing this, Mary makes her own the prayer and activity of the Church. This gives confidence in the face of trials. No matter what difficulties come (nowhere can one evade the ‘rage of the dragon against the woman’ and his war ‘with the rest of her offspring,’ the Christians), this woman is nourished through world-time with manna from on high, which keeps her alive and makes her fruitful: the victory of Christ will be hers... At this point we need to recall von Balthasar’s own admonition not to reduce consideration of Mary’s role to devotional piety. She has a social-ecclesial personality. Accordingly, while from the world’s point of view the Woman remains u-topian and without ‘form,’ something of her invisible form is discernible in her genuine children. In them the invisible realities become visible.